Orchestra Grey Bruce is made up of musicians from Bruce, Grey and Huron counties plus soloists from across Ontario and Quebec. For the concert December 15 the Orchestra will include soloists Jeremy Potts and Reanne Kruisselbrink, violins, Rob Davidson, viola, Thomas Beard, cello and James Gannett, bass, as well as 25 orchestra members. The Saugeen County Chorus is a collection of 50 talented vocalists, mostly from the Kincardine area, but others from Southampton, Port Elgin, Paisley, Clifford, Inverhuron, Lucknow and Goderich. Many of the chorus members also sing with other choirs in the area including: A Capella and Chantry Singers from Port Elgin; The Paisley Concert Choir from Paisley; and the Kincardine Community Singers and Celebration Singers from Kincardine. The Orchestra and Chorus have collaborated over the years to produce consistently top-quality concerts including large choral works such as Haydn’s The Seasons and The Creation. It’s inspiring to realize this group has achieved 20 consecutive years of Handel’s Messiah performances! None of this would have been possible without the support and enthusiasm of Kincardine Summer Music Festival Volunteers, friends and family. 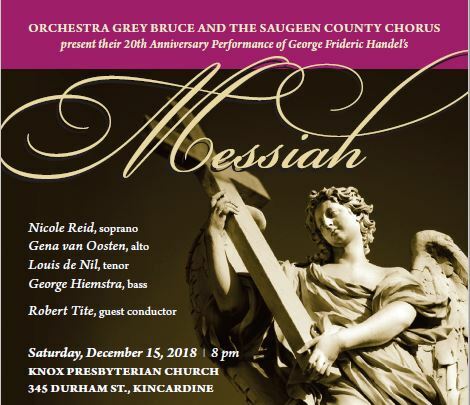 Tickets are $20, available from Harbour Rose Boutique and Quinn Florist in Kincardine, Ralph’s Hi-Way Shopette in Port Elgin, online at Ticketscene, from Chorus and Orchestra members, or at the door. Ages 16 and under are free!